President Trump's campaign on Tuesday filed charges against former aide Omarosa Manigault-Newman, claiming she violated a 2016 nondisclosure agreement (NDA) by disparaging the president in her new book, and secretly recording conversations with Trump and White House chief of staff John Kelly, the latter of which took place in the ultra-secure Situation Room - a SCIF (Sensitive Compartmented Information Facility) when Kelly fired her last December, reports the Washington Examiner. In New York, Trump campaign lawyers filed for arbitration to force the former star of “The Apprentice” to abide by the agreement they say she signed when joining the 2016 campaign. 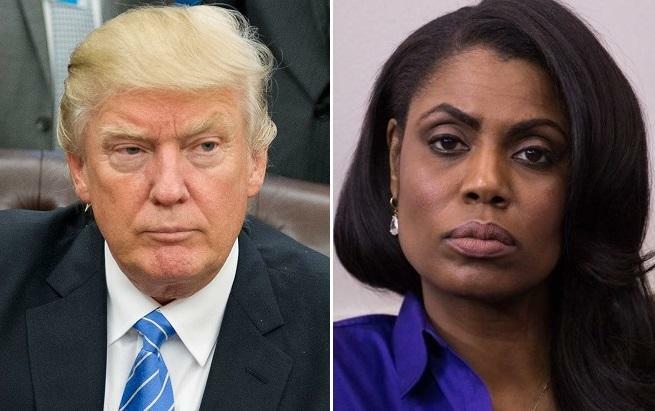 A Trump campaign official said in a statement "Donald J. Trump for President, Inc. has filed an arbitration against Omarosa Manigault-Newman, with the American Arbitration Association in New York City, for breach of her 2016 confidentiality agreement with the Trump Campaign," adding "President Trump is well known for giving people opportunities to advance in their careers and lives over the decades, but wrong is wrong, and a direct violation of an agreement must be addressed and the violator must be held accountable." On Tuesday, Omarosa provided CBS News with a new tape in which several Trump campaign officials reportedly discuss how to handle the fallout over an alleged tape of Trump using the N-word during his time on The Apprentice. "I am trying to find at least what context it was used in to help us maybe try to figure out a way to spin it," Pierson is heard saying. Patton then described a conversation she had with then-candidate Trump about making the slur. Patton: "I said, 'Well, sir, can you think of anytime where this happened?' And he said, 'no.'" Omarosa: "Well, that is not true." Patton: "He goes, how do you think I should handle it and I told him exactly what you just said, Omarosa, which is well, it depends on what scenario you are talking about. And he said, well, why don't you just go ahead and put it to bed." Pierson denied the call ever took place on Monday night - before CBS obtained the recording, saying "No, Ed (Henry). That did not happen. Sounds like she is writing the script for a movie." Then on Tuesday, Patton and Pierson issued a joint statement, saying "No one ever denied the existence of conversations about a reported 'Apprentice' tape. Of course there were multiple discussions about it." On Monday, President Trump tweeted: ". @MarkBurnettTV called to say that there are NO TAPES of the Apprentice where I used such a terrible and disgusting word as attributed by Wacky and Deranged Omarosa. I don’t have that word in my vocabulary, and never have." Omarosa's new disclosures coincide with the release of her new book, Unhinged. The former Apprentice contestant appeared on NBC's Meet the Press with Chuck Todd on Sunday where she dropped the Kelly recording - only to turn around and released a phone call with Trump in which he says he didn't know she was fired. What's more - Omarosa was caught in a lie about whether she heard President Trump use the N-word - claiming in her new book that someone told her pollster Frank Luntz heard Trump say it, which Luntz denied, while later telling NPR that she personally heard Trump say it. Luntz has denied this, calling Omarosa's fact checking "Very shoddy work." Another denied claim from her book is that former Trump attorney Michael Cohen was in a meeting in which Donald Trump took a note from Cohen and ate it. After Manigault-Newman released a second recording of her phone call with Trump post-firing, thje President hit back, tweeting: "Wacky Omarosa, who got fired 3 times on the Apprentice, now got fired for the last time. She never made it, never will. She begged me for a job, tears in her eyes, I said Ok," adding "People in the White House hated her. She was vicious, but not smart." "Nasty to people & would constantly miss meetings & work. When Gen. Kelly came on board he told me she was a loser & nothing but problems. I told him to try working it out, if possible, because she only said GREAT things about me - until she got fired!" Last Saturday, President Trump called Manigault-Newman a "lowlife" when asked if he felt betrayed by the former aide. White House staff, meanwhile, have slammed Omarosa as a "disgruntled former White House employee" trying to "profit off these false attacks."